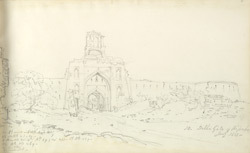 Pencil drawing of a gateway at the citadel of Hissar by Robert Smith (1787-1873) in 1813. This is one of 29 drawings (29 folios) of landscapes and architecture in the Punjab and Uttar Pradesh in 1812 and 1813. Inscribed on the original cover is: ' No. 4. Rewarry & Seik Country: Siharunpoor & Hurdwar. Lines of March etc. '; on the inside of the cover is: 'Drawn by Col Smith. R.E. Owner of the extensive round house at Paignton, Devon. Book of Sketches sold by auction at the above house - 4 of the books purchased by me. J. Pethwick. The Colonel was splendid as a draftsman, but the worst possible as a painter.' The drawings are inscribed with titles in pencil. Hissar in Northern India was founded by Firuz Shah Tughlaq in 1354 when he constructed a canal to bring water to his hunting ground here. He built further public buildings and a mosque on the site of the new town. In the 19th century the canal was renovated and incorporated into the West Yamuna Canal. The town contains many interesting ruins such as the Gujari Mahal, an old fort built from the remains of a Jain temple, and the late fourteenth-century mosque of Firuz Shah. To the east of the town lies the Jahaz Mahal, an unusual building shaped like a ship.